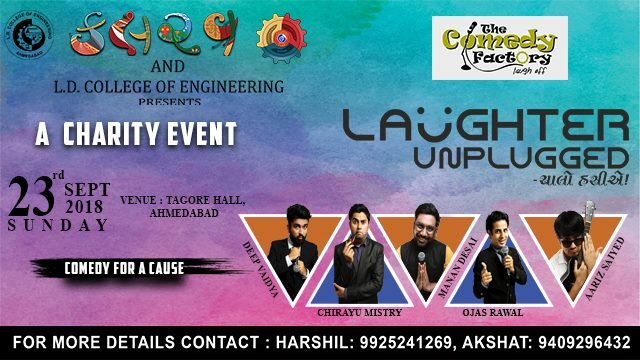 L.D.College of Engineering’s first ever annual socio-cultural fest “KALRAV” is organizing a comedy show for a social cause as one of the pre-event. Gujarati Comedy sensations Manan Desai, Ojas Rawal, Chirayu Mistry, Aariz Saiyed and Deep Vaidya i.e: The Whole Panel of The Comedy Factory on 23rd September, 2018 SUNDAY 7:30 pm onwards. Join us and have a great time with us.